Ask most people to name their favorite holiday, and you’ll get plenty of Easter, Halloween, Thanksgiving and Christmas responses. Chances are, New Year’s Eve won’t be #1 for most folks, but it’s definitely #1 for me. And my favorite part of New Year’s Eve is the delicious party food. Oh sure, nowadays (married, in my 30s and with a four-year-old), New Year’s Eve is more about cuddling up on the couch with my hubby to watch the ball drop and less about partying with friends and lining up shots. But that’s okay, because even though the shots are gone (and that’s probably a good thing), they’ve been replaced by a smorgasbord of snacks and food. For this year’s December 31 menu, I’ve decided to test out a few new recipes. One of those creations is Jalapeno Hush Puppies. The secret ingredient in the hush puppies — besides jalapeno peppers, of course — is Tabasco Green Jalapeno sauce. The sauce also comes in handy as an addition to the ranch dipping sauce that will be served with the hush puppies. 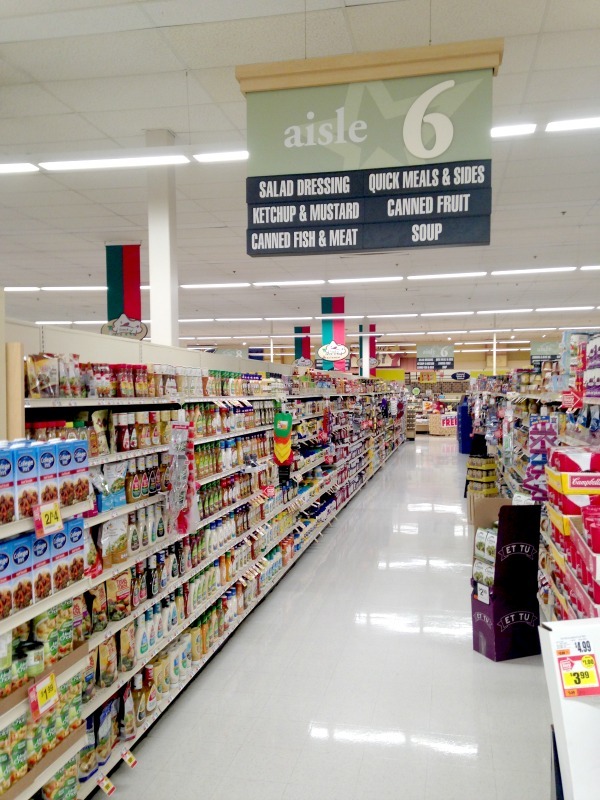 You can find Tabasco Green Jalapeno sauce at just about any grocery store that sells Tabasco sauce. I got mine at my local Giant grocery store, where it’s conveniently located in the condiment aisle. While I was there, I also picked up a bottle of original Tabasco sauce, because you can never have too much of that on hand! What I like most about the Tabasco Green Jalapeno sauce is how versatile it is. Yes, it’s delish as a topping on omelets and other dishes, but it’s also a tasty ingredient in so many different dishes. The sauce is smoky and savory, which helps to bring out the flavor in everything from appetizers to entrees to desserts (that’s right, you can add Tabasco sauce to dessert!). I was a little nervous about the deep frying part of the process, but making the hush puppies was actually easier than I thought it would be. We don’t have a deep fryer, but you can make do without one by filling a pot with about three inches of vegetable oil and using a candy thermometer to make sure the temperature stays between 350-375 degrees. After that, you just drop in the balls of dough, and about two minutes later they’re golden brown and ready to eat! Feel free to check out the Tabasco website for more holiday party recipes and party food tips. While you’re there, don’t forget to grab the coupon! You can also follow Tabasco on Facebook for all sorts of tips, recipes and offers! I am not sure exactly what a hush puppy is because we don’t have them here in the north, but they sound delicious. My family learned to love hush puppies from our time living in the South. Can’t wait to surprise my family by making them myself. oh those sound delicious. I know everyone in my family would love them. Thanks for sharing. 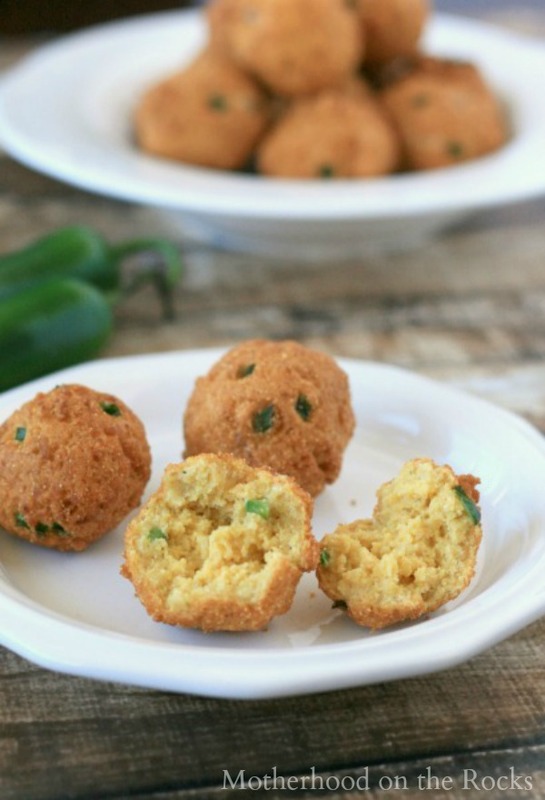 Jalapeno hush puppies look great! We have Mexican food once a week in our house. Maybe I’ll add these to the menu the next time. 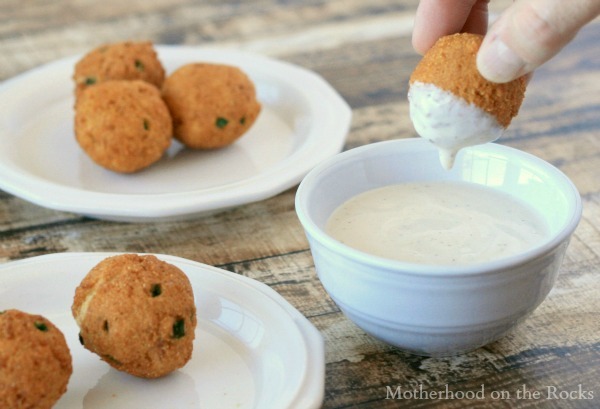 I love hush puppies, and my mouth is watering just looking at these! These look and sound delicious! I love hushpuppies!! 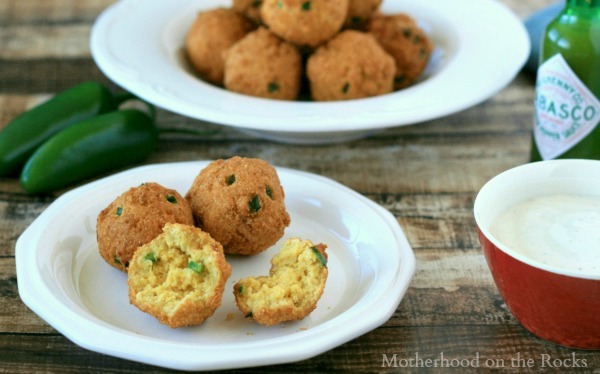 Love hush puppies, love Tabasco, love jalapeno! I have GOT to try this. YUM! Oh my, these look delicious! I’m sure my hubby would love them! Definitely pinning for later – thanks for sharing! I have not had hush puppies in years. This recipe sounds amazing. These look delicious! I want to try them! Hush puppies with Jalepeno?? Oh yes, that’s getting pinned and made at my place. I just tried one of those for the first time and it was delish. Love the idea of a Tabasco kick! I love these. They look really good and tasty. I’ve actually never made hush puppies but now that I’ve seen your recipe and how delicious it looks, I’m going to try and make your recipe. 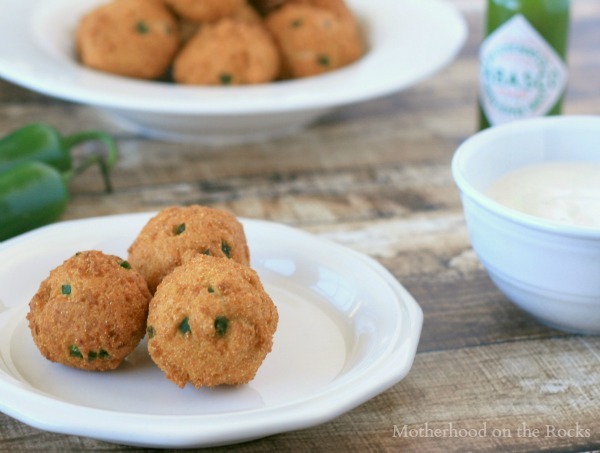 We love Hush Puppies – your recipe looks so tasty! Pinning! These hush puppies looks delicious. I am going to have to try this recipe. Anything with Tabasco sauce is a recipe for me. The hotter, the better, I say. What a unique recipe. I wouldn’t have thought of adding Tabasco Sauce to hush puppies! This would be a great way to spice up a traditional sea food meal. Great idea! These look perfect! Now I feel like I need to attempt this. Thanks for the recipe. Never had green tabasco before but may need to grab some! Those hushpuppies look so good. I am a southern girl, so this is right up my alley. Mmmm, I bet those get eaten in no time flat at parties! Yum!